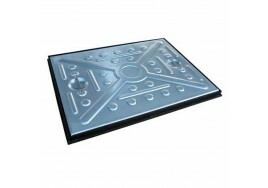 Covers are made from pressed steel incorporating a non slip surface and dished lifting holes. They are then finished by hot dip galvanising. 663 x 513 x 23mm including frame. 5 tonnes loading capacity, suitable for domestic driveway applications.